Browse 71 categories of problem-solving information. The common swimming pool topics have been broken down to several broad categories. Each of these categories covers a different area of interest, in the "Ask Alan" archives. Listed below, are the specific topics covered, in that section. Click on the topic, of particular interest, to go to the appropriate subject matter. Because the categories and pool care subjects are not always clearly defined, you might want to browse through some of the related topics. The Website Table of Contents can be useful, in locating information of particular interest and can be accessed, using the Pool Topics Link, on top of every page. Enjoy the journey! Blue-Green Algae: the most common type of pool algae. Black Algae: a resistant, hard to treat type of problem pool algae. Pink Algae: a treatable, slimy, bacterial water problem. Yellow-Mustard Algae: a recurring problem algae. Pollen-like in appearance. Miscellaneous Algae: thousands of varieties exist. Slimes and Water Mold: results of inadequate pool water sanitation. Algae Control Products: aids in treatment and control of unsightly algae growths. • Salt Chlorine Generators Store: the better way to use chlorine and enhance results. • Solar-Powered Pool Purifier Store: solves algae problems and reduces sanitizer usage. • Ultraviolet Pool Sterilizer Store: solves odor problems and reduces sanitizer usage. • UV Solar Pool Sanitizer Store: uses solar-power and UV to reduce chlorine usage. Calculating Chemical Additions: getting the chemistry right is the key to water quality. Calcium Hardness and Scale: hard or soft pool water can lead to different problems. Chlorine Stabilizer and Conditioner: protects chlorine from destruction, by Sunlight. Pool Water Testing: another important key to maintaining proper pool water quality. • Electronic, Digital Pool Water Testers: there's a ColorQ Test Kit, for every pool need. • Specialty Test Kits: individual testers for a variety of pool water test factors. Langelier or Saturation Index: calculations that deal with corrosive or scaling conditions. Metric Conversion: converting English type units to metric or the reverse. Calculating Pool Volume: simple to figure and easy to follow calculations. Corrosive Pool Water: controlling corrosion avoids damage to equipment & surfaces. • The In-Line Anode Store: helping solve common metal corrosion problems. Miscellaneous Pool Chemicals: less-common chemicals have many important uses. Pool Chemical Safety: safe chemical usage is important for aquatic piece of mind. Cloudy Pool Water: the causes of hazy or dull pool water can involve several factors. Pool Filter Problems: another important key for optimum water quality and clarity. Foaming and Scum: causes unsightly water conditions and needs to be eliminated. Kids' Pool Problems: about "kids" being "kids." • Aquatic Electrical Safety Systems: warns against electrical hazards. Pool Water Discoloration: there are many causes and remedies to match. • Discoloration and Stain Treatment Store: solve metals, discoloration and stains. Rashes, Irritations and Odors: solving and avoiding poor pool sanitation problems. Chlorine: the most popular pool water sanitizer. Used in many forms. Salt Chlorine Generators: a better way to chlorinate a pool. No measuring or handling. • Salt Chlorinator Store: a variety of salt chlorine generator options, for all types of pools. Bromine: a popular chlorine alternative. Biguanide: a popular alternative pool water sanitizer. Ionizers - Purifiers - Mineralizers: sanitizes pools utilizing metallic ions. • Solar-Powered Pool Purifier Store: solves algae problems & reduces sanitizer usage. UltraViolet (UV) Pool Sterilizers: reduces bacterial and algal populations. • Ultraviolet Sterilizer Store: kills resistant microbes, while reducing chemical usage. Alternative Pool Sanitizers: exploring some of the other choices and combinations. Shock Treatment: boosts the Free Chlorine or Bromine levels. Borates Use In Pools: helps provide an assist with algae control problems. Pool Staining: problems caused by some heavy metals, minerals or certain organic matter. • Stain Prevention, Removal and Treatment Store: solve metals & mineral problems. Copper Problems: depending upon the source, too much can lead to problems. Iron Problems: causes staining and discoloration and needs to be properly controlled. • Heavy Metals Treatment Store: removes metals & help avoid metal staining problems. Manganese Problems: stains surfaces and discolor water & requires proper treatment. Nitrate Problems: can accelerate algae growth, by acting as a fertilizer. Phosphate Problems: can promote algae growth, but can be treated. • Phosphate Treatment Store: removes phosphates and dissolved heavy metals. Sulfur Problems: a problem with some well water, causes unpleasant odors & conditions. Well Water Pool Problems: well water can introduce a host of problematic minerals. • Well Water Treatment Store: removes metals before the water is added to the pool. Leaking Pool Problems: solutions and suggestions to help find and seal a pool leak. Fix A Leak, How To Use Directions: how to use Fix A Leak sealant, more effectively. • The Fix A Leak Store: how Fix A Leak seals many commons types of pool leaks. Pool Leak Detection: locating and fixing leaks, while minimizing any damage. Crack (Structural Concrete) Repairs: fixing concrete and structural cracks. • Structural Concrete Crack Repair Store: making rock-solid repairs. Pool Opening or Start-Up: getting started correctly, gets you swimming sooner. Pool Closing or Winterizing: the season's end. Protect your investment - do it right. Miscellaneous Pool Problems: odds and ends and hard to categorize pool topics. Pool Maintenance, Miscellaneous: doing some common pool tasks. Pool Finishes: plaster, aggregate, fiberglass and more. Pool Paints and Coatings: epoxy, paint, PVC and more. Vinyl Liner Problems: proper liner care & practices help maintain better appearance. Above-Ground Pools: helpful general information. Inground Pools: helpful general information. Fiberglass Pools: helpful general information. Automatic and Robotic Pool Cleaners: saves time and effort, with better results. 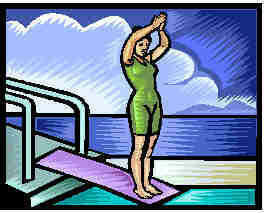 Aquatic Fitness and Exercise: suggestions and more about using a pool to stay fit. • Aquatic Fitness Trainers Store: swim endlessly in place, in any type of pool. Pool Safety Products: helping keep the pool safe, for better enjoyment. • Swim Safety Systems: Swim Safety Monitoring System. Commercial Pool Questions: things to consider. Tips For Healthy Swimming: suggestions from the Center for Disease Control (CDC). Pet and Animal Water Safety: avoiding animal drownings. Give critters an escape route. Pool Automation: controllers for easy pool living, help ensure better water quality. Pool Heaters and Heat Pumps: choices, problems and solutions. Winter Pool Covers: helps protect your investment, making springtime opening easier. Safety Pool Covers: adds great convenience, provides safety and reduces costs. Learn . . . More About Pools!!! More Pool Information . . . is just a click away!!!!! Browse through information from some of the leading Pool Product Companies and access links to their websites. More information is just a click away. On a daily basis, we'll try and add a brief, helpful pool or spa tip and retain the most recent posts. We hope that you'll find the information and links, both timely and helpful. For locating information or products, use this alphabetical listing of the entire website's content. A quick way to locate the product or information, that you're looking for.